Richard von Frankenberg was a man with many interests. 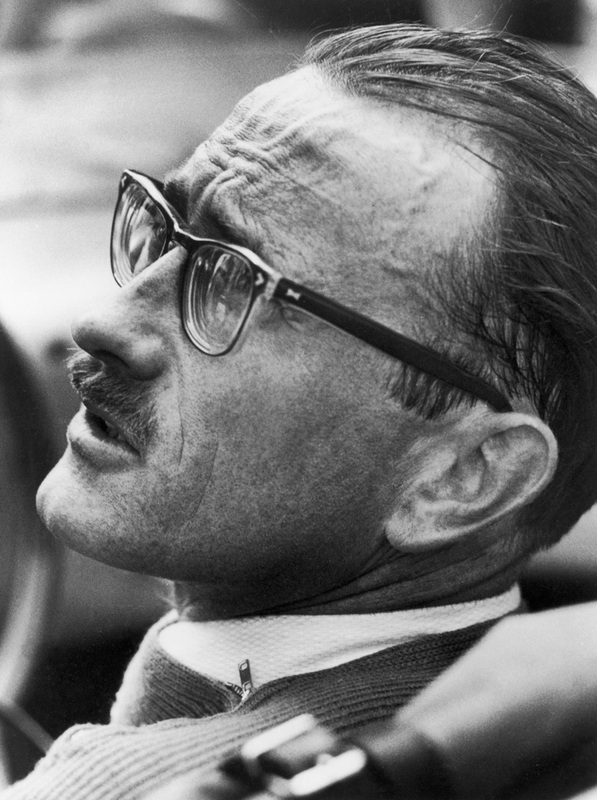 He competed in many motor races for Porsche and created the customer magazine ‘Christophorus’. Donald von Frankenberg, the eldest son, gave his father’s biography a title that could be translated as ‘Richard von Frankenberg – Life in the Fast Lane’. It is a fitting epithet for the life of a man who was always looking for new challenges. Between 1953 and 1960, he was part of the Porsche works team. He celebrated class victories on many famous race circuits around the world, including Le Mans and the Targa Florio. In 1955, he was German champion in the class for racing cars up to 1500 cc. Coming from a Silesian noble family, von Frankenberg was a mechanical engineer who began to establish a press department at Porsche in 1950. In 1952 he created ‘Christophorus’, and for many years he remained editor-in-chief of the Porsche customer magazine. Born in Darmstadt, the family later lived on Gartenstrasse in Tübingen. At the age of 16, Richard was forced to watch as the synagogue opposite his home was burned down by Nazis on 9 November 1938. In secret, von Frankenberg photographed the attacks that took place on Kristallnacht. In the 1938 census, the von Frankenberg were classified as a ‘Jewish household’. Throughout his lifetime, the journalist and racing driver discussed the crimes of the Nazi regime. Under the pseudonym Herbert A. Quint, he and co-author Walter Görlitz wrote the first biography about Hitler after World War II. The book was released in 1952. After leaving Porsche, von Frankenberg became a television presenter and President of the German Racing Drivers’ Association (DSK). In newspaper interviews, it became apparent that he had taken a much closer interest in road safety than events on the race track. Richard von Frankenberg survived numerous serious accidents in motor sport and on the road. In 1973, however, the 51-year-old died in a road traffic accident that was caused by no fault of his own. He crashed his 911 T into a Ford Transit that was positioned across the motorway between Stuttgart and Heilbronn.